Bio-tiful’s award-winning kefir made with organic whole milk. Kefir, a naturally cultured milk drink, has long been revered in Russia and Eastern Europe. Refreshing, zesty and tangy, with a velvety smooth texture – it’s as versatile as yoghurt, with a more complex flavour and fantastic health benefits. Drink on its own as a snack or soothing bedtime drink. Alternatively, pour over fresh fruits or granola, whizz into smoothies, or use instead of butter and cream for healthier cooking and baking. Keep in the fridge for up to 7 days and use by the date on the label. Suitable for home freezing. Winner of the Dairy Innovations Awards 2013, Bio-tiful Dairy is one of the few specialists in the UK to produce top quality organic cultured milk drinks. What’s more, the company shares many of our values, from its passion for using only the best quality organic ingredients to its commitment to recyclable packaging. Why is kefir so good for you? 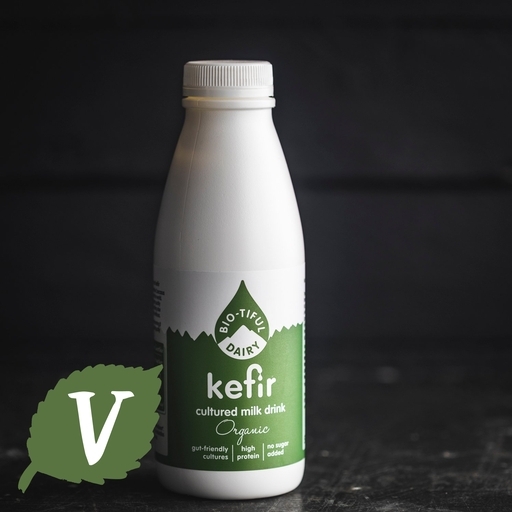 The word kefir means ‘feel good’ in Turkish. The drink’s health benefits have been proclaimed across the world for centuries, and now modern science is able to tell us why: kefir is packed with nutrients, including amino acids, enzymes, calcium, phosphorus, magnesium and B vitamins. It’s also rich with billions of gut-friendly bacteria. Apparently, you can even apply it to your skin to smooth out imperfections – but we think it’s far too tasty for that. Better just to drink it! Whole pasteurised homogenised cow's milk fermented with live kefir cultures* (Bifidobacterium*, Lactobacillus acidophilus*, Lactobacillus plantarum*, Lactobacillus casei*, Lactobacillus rhamnosus*).